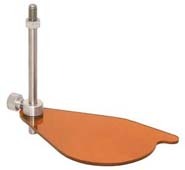 Swingaway amber filter assembly for DeVere vertical enlargers. Easily installed on DeVere 203, 504, 507, and 5108 enlargers. The filter can be moved up or down on the mounting post as required, to keep the filter close to the front of the lens. For general information on DeVere enlargers and accessories, please refer to our DeVere Enlarger Guide. The swingaway red filter is still available, see the link below in the "Related Products" section.